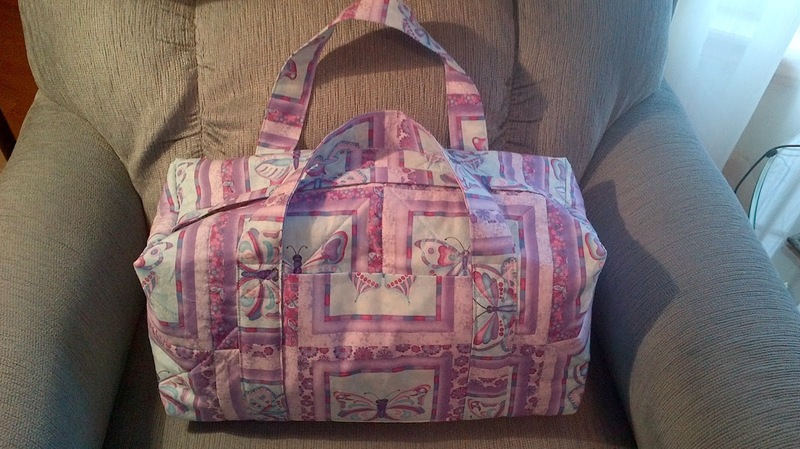 This charming little duffle bag is for the two year old daughter of one of my daughter's friends. It is my last sewing project for this Christmas. I sure don't have much practice with girly stuff but I did have the right colour threads for the top stitching. My grandsons and the little girl's older brother all have their own bags. 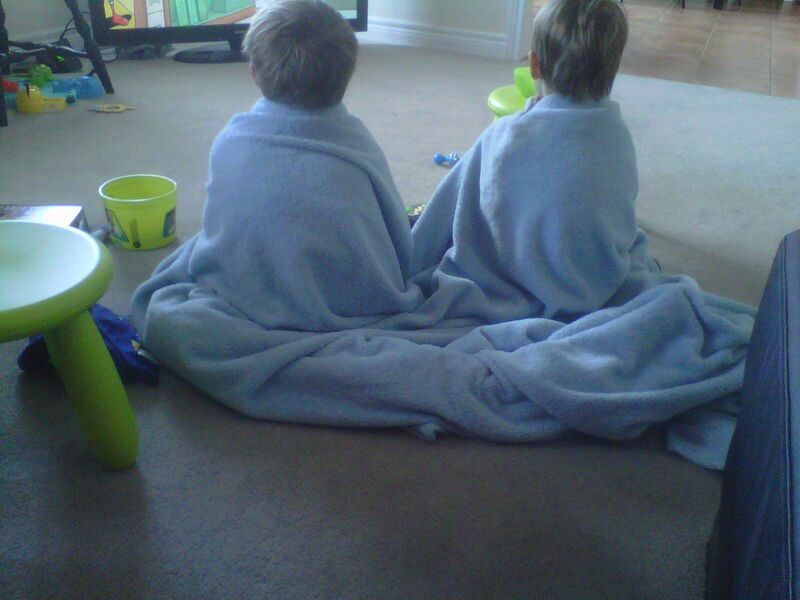 They are just the right size for a sleepover at Grandma's or a friends. Room for some jammies a couple of toys and a change of clothes. I hope she approves. Now the attitude problem. I really do not enjoy spending time in the kitchen baking or for that matter cooking. I did in a weak moment offer to bring some Christmas cookies to our daughter's next week. I got the dough ready and chilled and then I could not get it to roll out. I think I had it too dry and too chilled. Hubby to the rescue. He played with it for a while and got it to roll out. Then he cut the shapes and I put on the sprinkles. What a team. I get frustrated almost instantly when I can't do something right in the kitchen but will sit for hours at my sewing machine trying to figure something out. So maybe it is just a partial adjustment that is needed. The Stashbuster yahoo group has a number of members suggesting a word to live by for 2014. I am still thinking about my choice. Will it be BALANCE? FUN? COMPLETION? SCRAPS? JUST SAY NO! I have not decided. 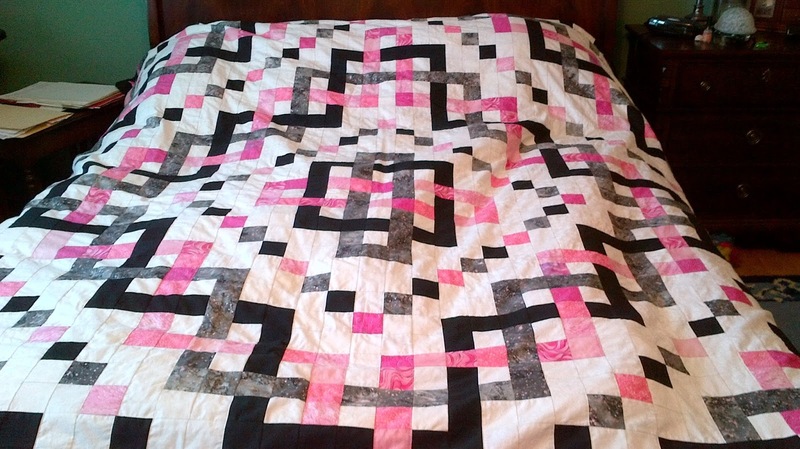 I have also noticed that there are quite a few new BOM's up or advertised as well as some Quilt Alongs. These are so tempting I just don't need or want any more UFO's in my life at the moment. Welcome Blogathon visitors. I hope you have enjoyed your cross Canada experiences this week. My name is Joanne and I live on the shores of Lake Huron. I am posting this Friday night as we are in a snow squall warning and I am not certain we will have power tomorrow morning. 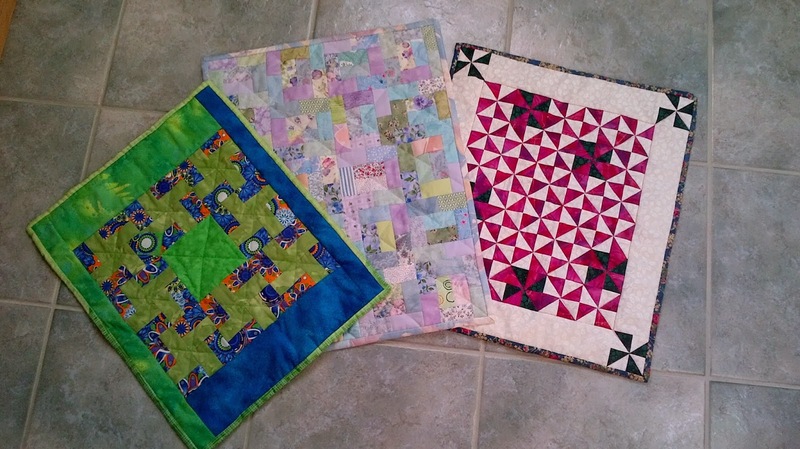 These three quilts were finishes for this week. They will all go to my local Scrapbag Quilters group next Wednesday. They are ready to find new homes. 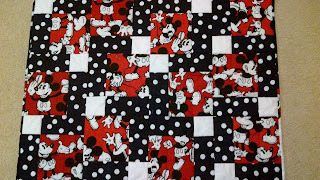 The scrappy one was done as a mystery with the on-line group One Stitch at a Time. I must say I have forgotten just how many years ago. It finally got the binding done and the label on. The bottom two quilts are doll quilts. We donate them to the toy drive. 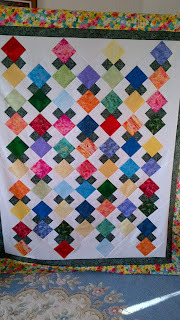 The white with rainbow strips was a variation of a doll quilt pattern I saw on Lyn Brown's web site last year. 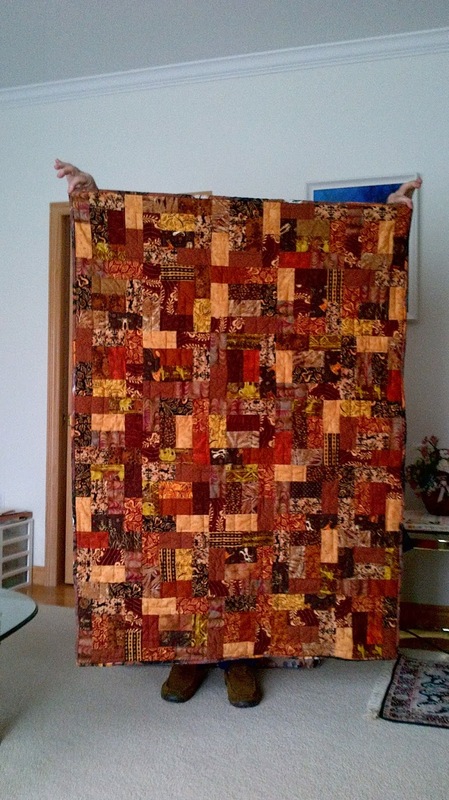 The other one was made using the bits that were left and stretching them to doll quilt size. 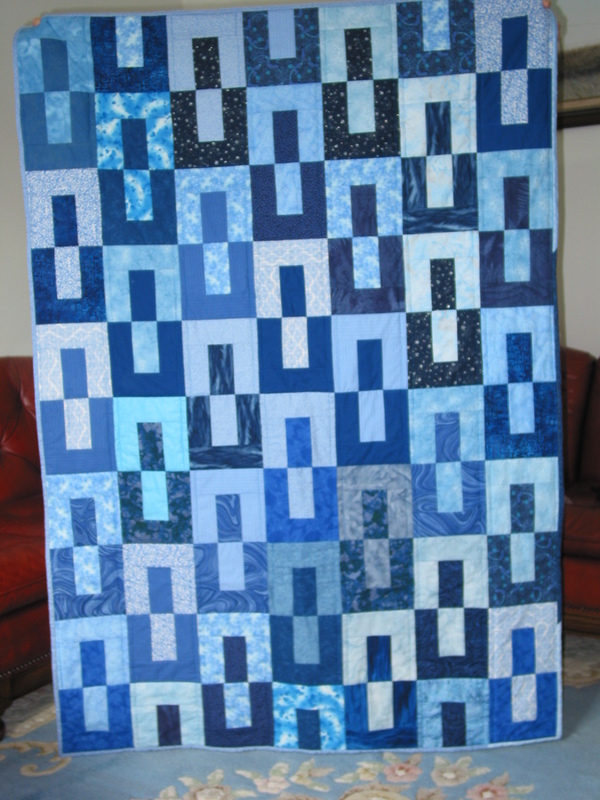 This is a mystery quilt pattern I tested for The Quilt Pattern Magazine (TQPM) an on-line quilting magazine. the designer is a Canadian, Janet Barker from Calgary. 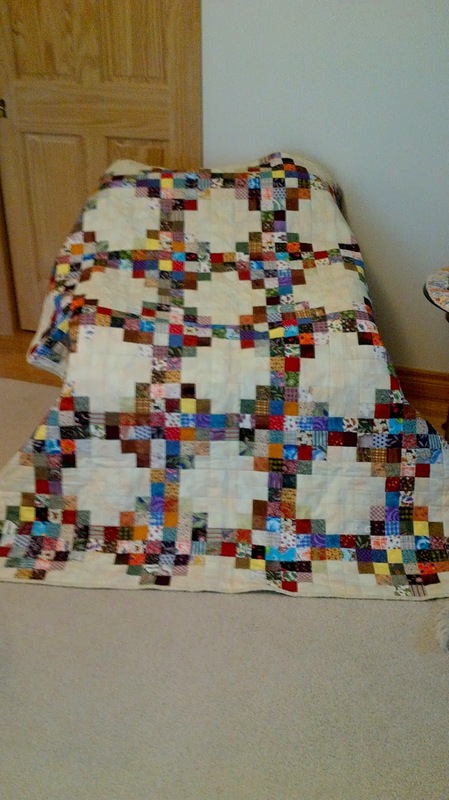 I gave the quilt to my sister this past weekend. Only a little late for a milestone birthday she had this year. 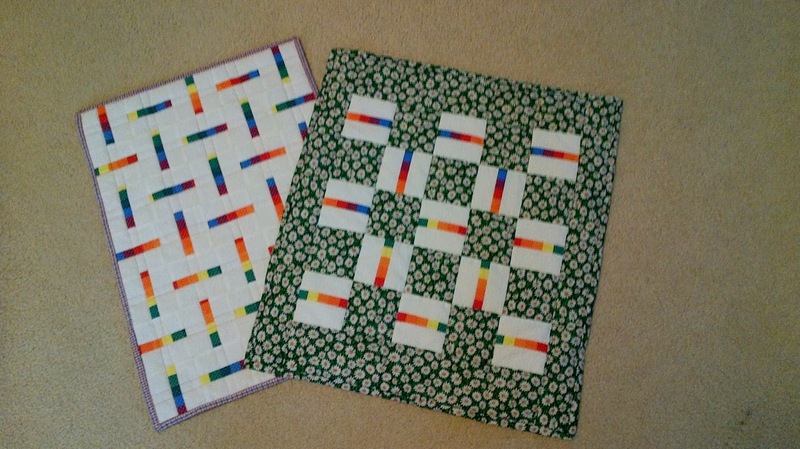 I will show you the quilt I made from the blocks I tested. It is a simple nine patch setting. The fabric line is Feathered Friends from Northcott Fabrics. It had a number of directional prints and that required some thinking when I put the blocks together. 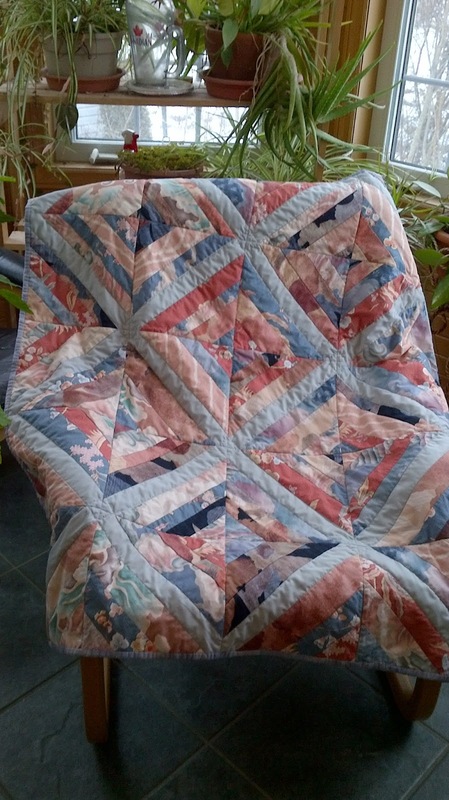 I ended up quilting it myself on my 60+ year old Bernina because the person I had asked to machine quilt it could not do it when the time came to get it done. So I worried that my quilting on a domestic machine would not be up to current standards. But I think there are still a few of us out there who use our domestic machines for our own quilting. 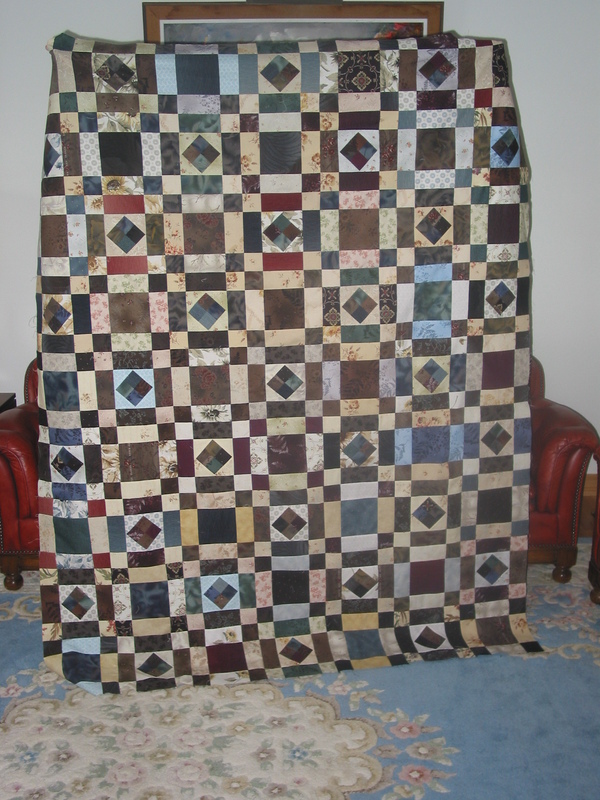 Or perhaps I should have said the time of year to finish doll quilts. I am not in any exchanges so the doll quilts that I make go to the local toy drive. The three pictured are the start for this year. The blue and green one has some of Mary from Kincardine's left overs added to some other scraps. I was able to get 8 windmill blocks and then added other pieces to make it a reasonable size. The middle one is made up of my tiny bricks in pastel colours. The one on the right has been languishing forever. 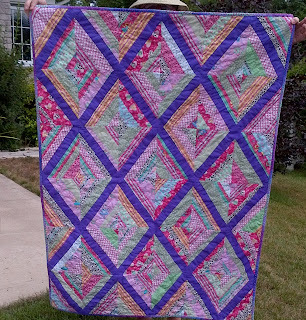 It was the waste (or bonus) triangles from a mystery quilt made several years ago. I am trying to get some control back in my sewing room so every bit that gets finished and out of there is a good thing. 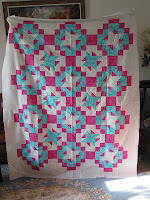 I tested this block for Alyce of Blossom Heart Quilts (here). 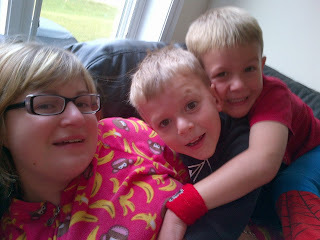 She had hoped to post the pattern today but as often happens, at our house anyway, life got in the way. So watch for it soon. 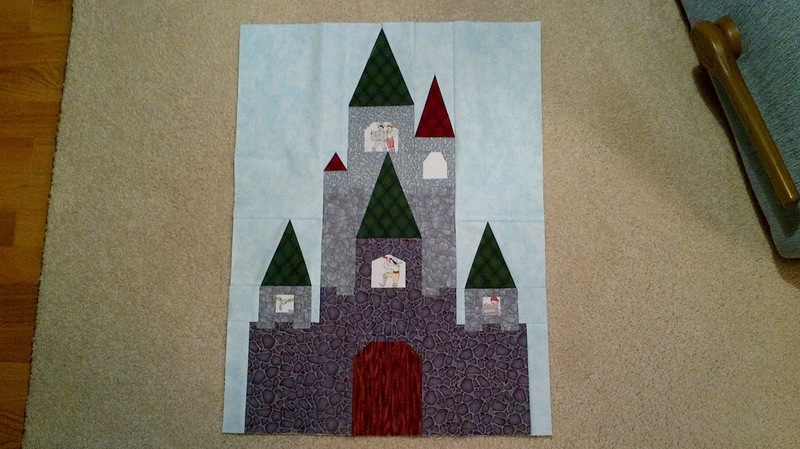 It is an 18" by 24" block and she called it Fairy Tale Castle. I fussy cut pirates for the windows so mine is called Pirate Castle. 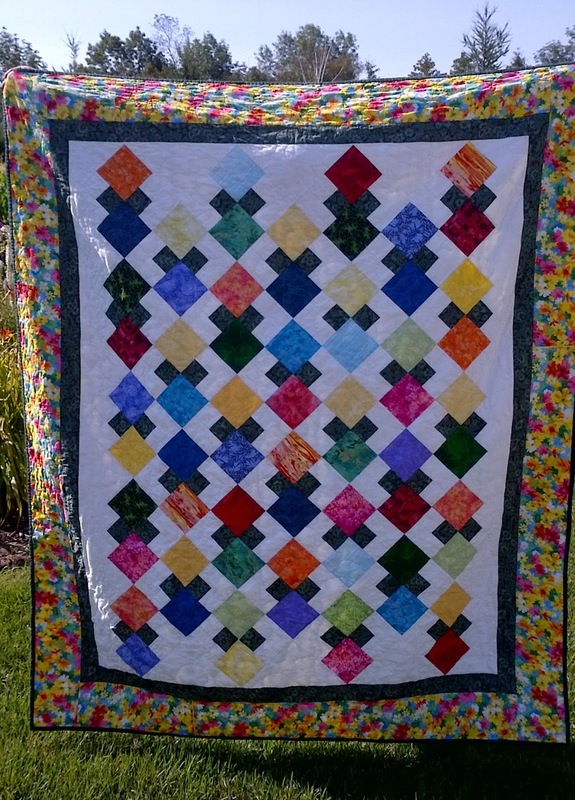 I am hoping to get mine quilted and bound this weekend. Kristy at Quiet Play (here) has a tester group also. I recently tested a block for her that she is planning to use next year. Lots of little pieces but it fit together well. Both of these young designers are very talented and it is a lot of fun testing their patterns for them. Family, where would we be without it? 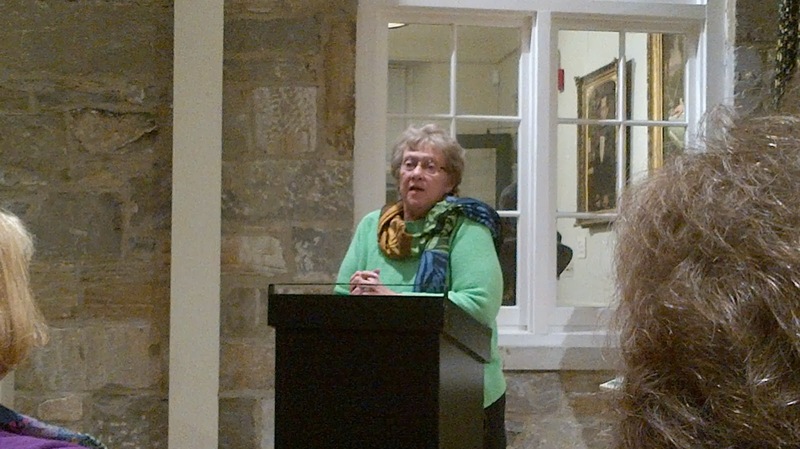 Brenda Papadakis gave an informative and entertaining talk of Friday evening at the Bennington Museum in Bennington Vermont. 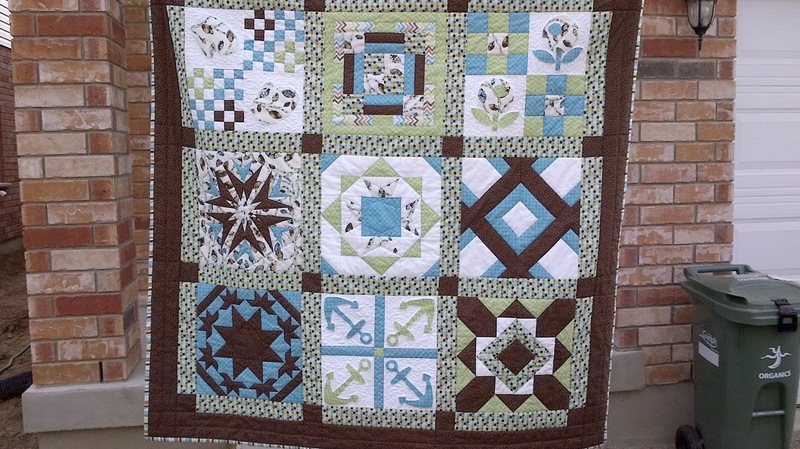 She described how she had come across the now famous Dear Jane quilt and how she ended up drafting the designs for the blocks found in the quilt. 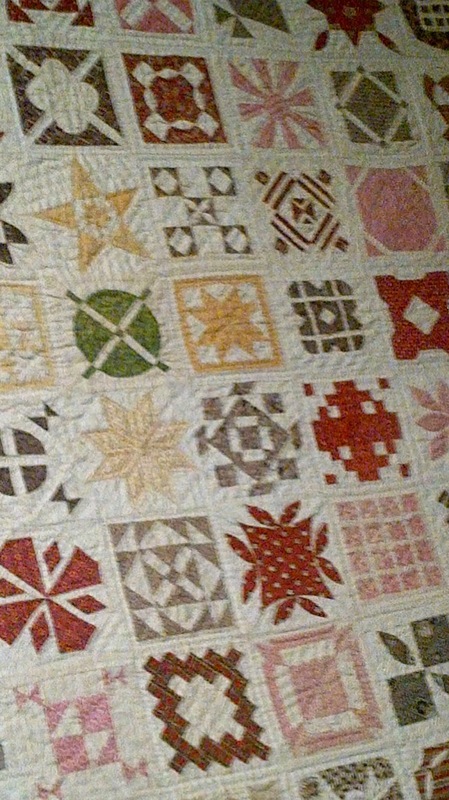 After her talk we had the opportunity to see the original quilt. I was amazed by its condition (excellent) and the depth of colour that was still present after 150 years. 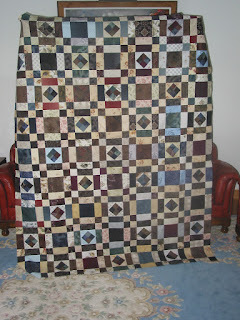 Yes this is the 150th anniversary of the quilt. I often wonder how my work will stand up after 20 years let alone 150. It would appear that the Dear Jane quilt wasn't actually used. There is a lot that is unknown about the quilt and its maker and this allows one to speculate and fill in the blanks on your own. This is one section of the quilt. 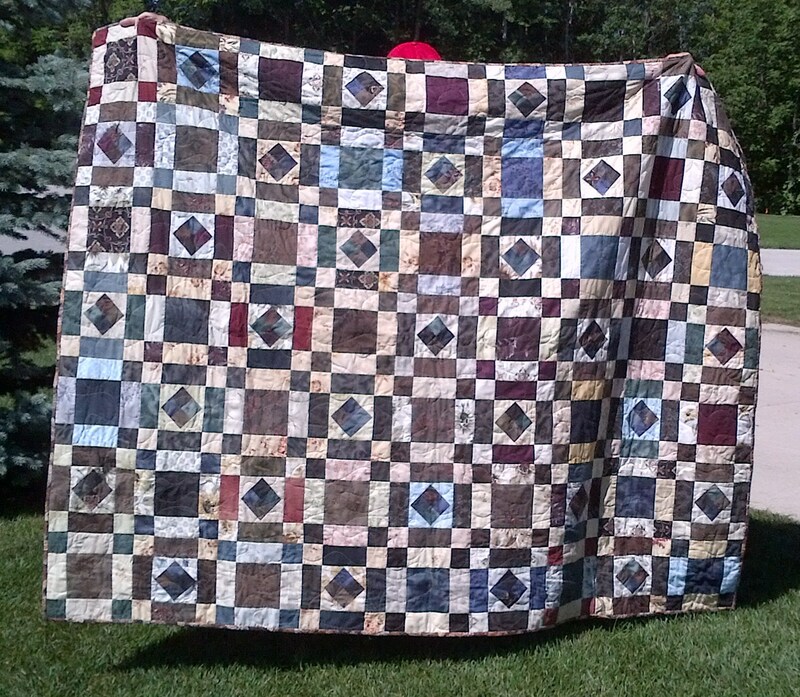 You could not stand back far enough to capture the full quilt in one shot. The Museum puts it on display for 6 weeks a year and we were there during that time. On Saturday I attended a workshop given by Brenda. We first introduced ourselves and I was surprised to see that four people in attendance had come from Calgary and another attendee was from Australia. We did a couple of the more challenging blocks. It was so much fun to get out and do some serious sewing with like minded people. 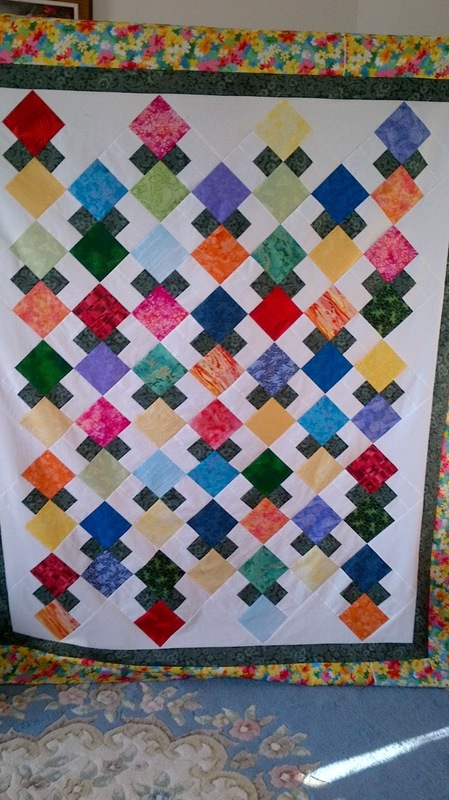 One woman at the workshop had completed one Dear Jane quilt in traditional colours and was now working on one in modern brights. Quite a contrast. 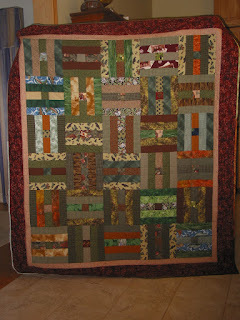 Mary Coates the guild past co-chair finished her quilt from the Scrap quilt workshop I taught last May. It is a hit with all her family and I can see why. Ann Finlayson our incoming co-chair is on the right. She was part of the measuring team. This year our Guild is joining the Walk to Niagara Challenge from the Canadian Quilters Association. So after show and tell the quilt or project goes to the measurement table for a measurement. We did not have a large number of items at this meeting. Our son-in-law passed away very suddenly two weeks ago. He was due to return from his two and a half years working in Virginia the following weekend. Mike was just 37. We have been doing what little we can to help our daughter and the boys during this incredibly challenging time. She has a wonderful group of friends and they have been a blessing. Mike's colleagues in Virginia were shocked too. They packed up what he had left in his apartment and drove his car back to Ontario thus sparing Jennifer a long weekend on the road. My creative energies have gone into hibernation and I hope they are allowed to wake up soon. 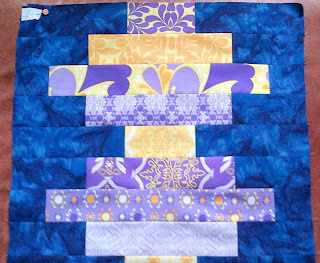 The only sewing I have done has been some mindless scrap quilt block components. 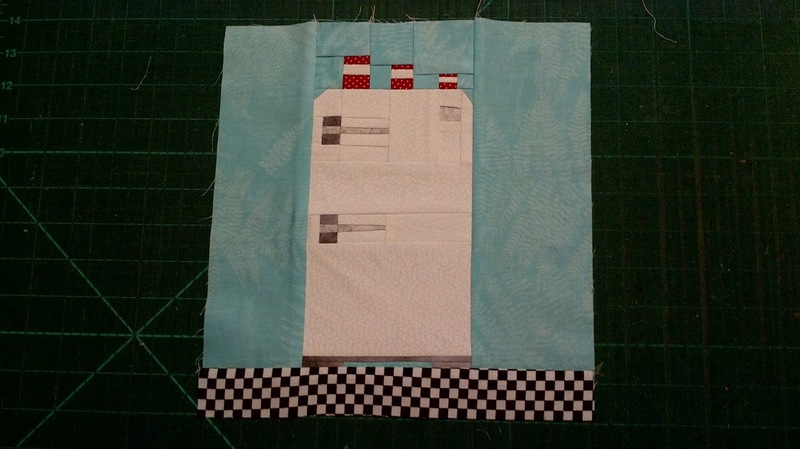 This is the first lantern from the current quilt along called Lantern Along by Jessica at quiltyhabit. Lots of straight stitching. It took me longer to pick out my pieces for the rows than it did to sew them together. 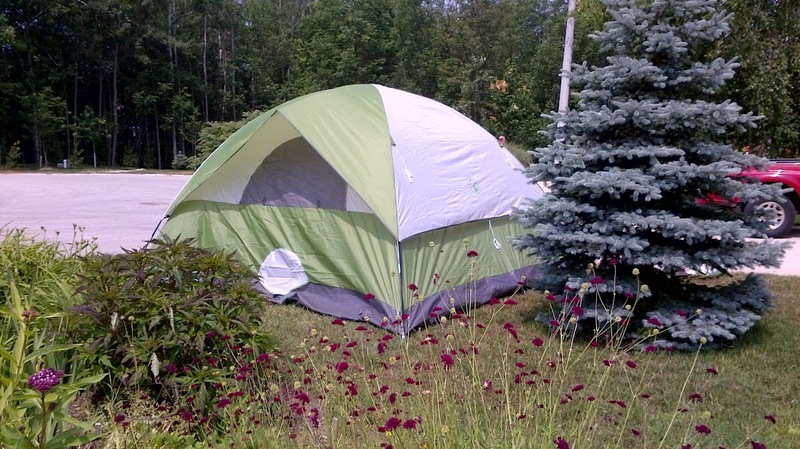 Today we had to set up the newly purchased tent to ensure that all required parts were in the package. And they were so tent is now down. We are hoping the boys will be able to spend the night in the tent in a couple of weeks when they are back for their next visit. They were out in a nasty storm a couple of years ago and the older one has declared he is not going to sleep outside. This tent is huge so hopefully he will be OK. We can keep the garage door open and he can scoot in if he feels the need. I have taken a bit of time away from my machine and done some reading. One book I found particularly interesting was Frozen in Time by Mitchell Zuckoff. It is a true story set in two different time periods, World War II and last year. A testament to character and perseverance. Tendonitis is still a problem for my shoulder. 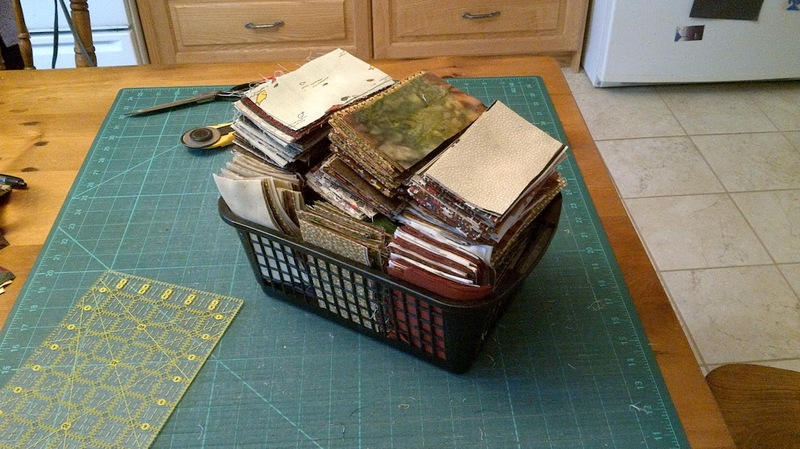 One of my Scrapbag friends offered to midarm some of the bigger quilts that need finishing. It still takes a long time to piece a backing. I got three done and delivered to her this week. I will be more than happy to tackle the binding when they are done. 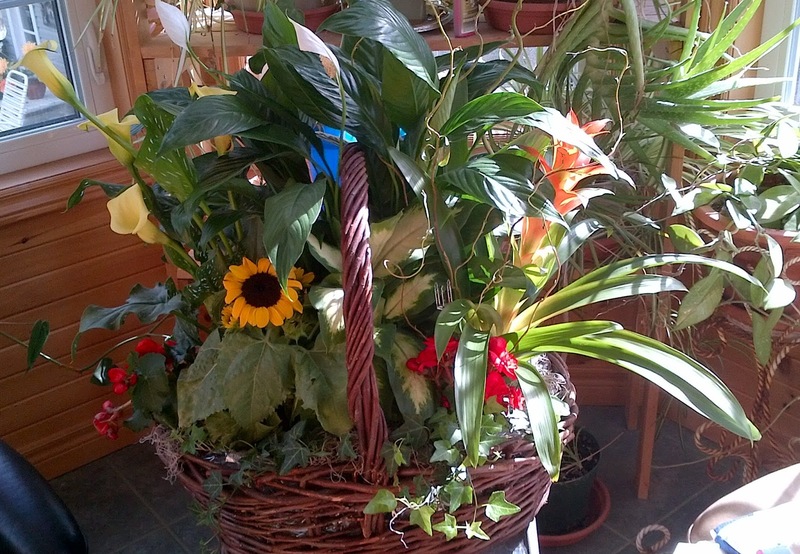 Yesterday afternoon our Loose Threads group had a relaxing time at Flora's cottage. Someone had given her a huge stack of felt and so we played with felt for a while. 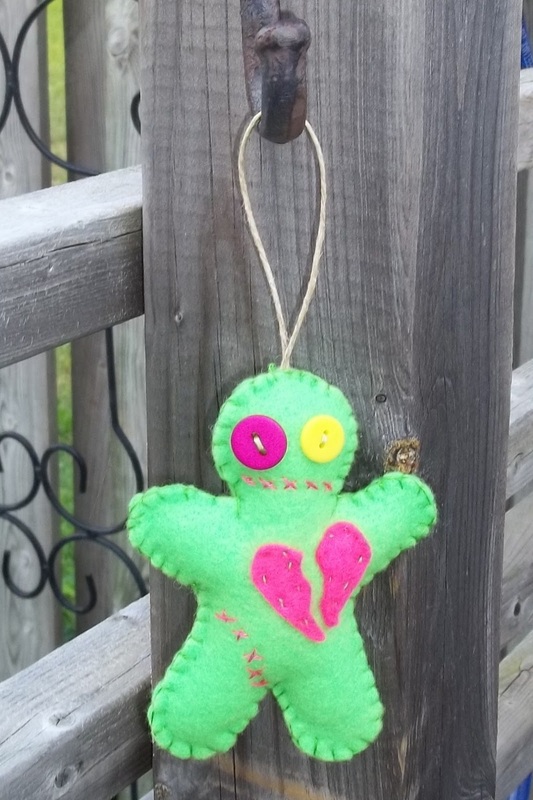 I made the little owl and Fran made the Valentine Voodoo doll. 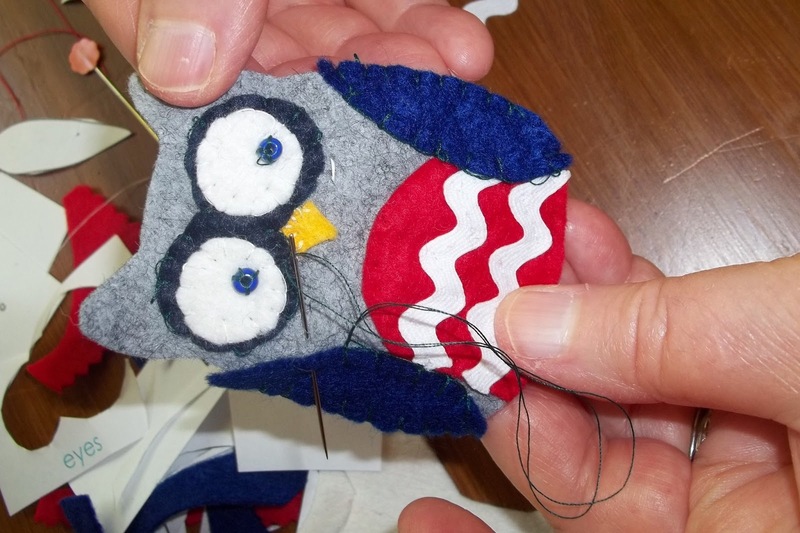 Fran found a significant number of felt craft ideas on line and I googled felt crafts for kids. I suspect grandson number one would be able to do simple stitches. He has made me promise to show him how to use my sewing machine this summer. 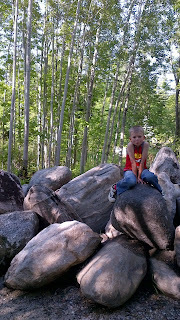 He is coming for a week in July so I think I know what we will be doing some of the time. Two of the women who took my Scrap Quilt Workshop in May brought their tops for show and share. I couldn't resist taking a photo. I thought they did a terrific job. It was a busy meeting. Draws were made for the various blocks of the month. I was sad not to win any of the draws but in a way relieved because it meant I did not have to find a block and make the kits for the same month next year. We had a terrific pot luck lunch. Many delicious salads. I love that as you can have a taste of so many different things. Several quinoa salads made an appearance this year. After lunch was done and cleaned up and the tables and chairs put away so that the Bridge players could take over for the afternoon we went on a little fabric acquisition road trip. There are Mennonite shops in the area and I did not know much about them. One car lead the way and the second car followed. There is no electricity in the shops so determining exact colour matches can be a challenge. I found a few pieces of fabric that decided they would be better off with me than staying at the shops. And I won a GiveAway on Sharon Vrooman's blog. She was giving away some charm packs and had two designed for the US and two for International. Since I was unfamiliar with all of them I said in my "comment" that whatever was available should I win would be fine. I was delighted to get an Avalon charm pack and a happy-go-lucky charm pack. This was the scene over the past weekend. 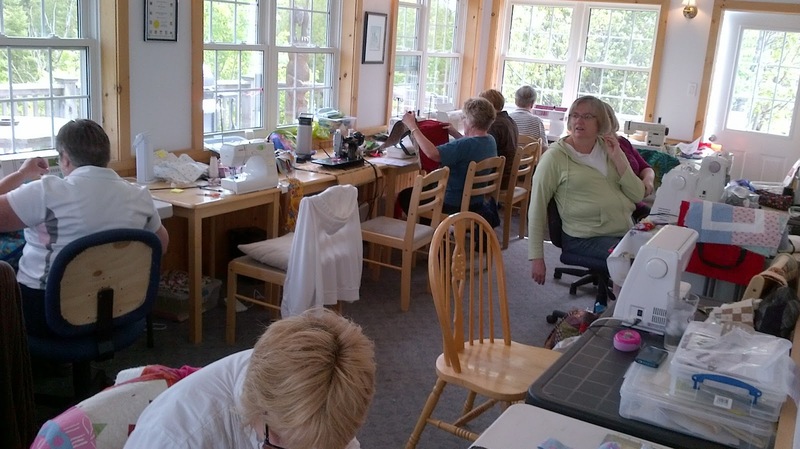 14 of us gathered in Tobermory at the Trails End Lodge for an extended weekend of quilting, visiting, good food and overall great fun. 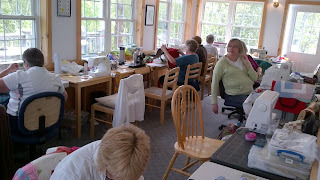 As you can see from the photo we each had our own sewing space. Gayle and Cathy are becoming very proficient at organizing these events. They handle the food and the main projects and developing a theme for the event. We can stitch the projects or bring our own UFO's. This year I did a little of each. I finished up the blocks from a mystery and from my second sample for the Scrap Workshop I lead at Kincardine. Both now move to the needs to be quilted pile. 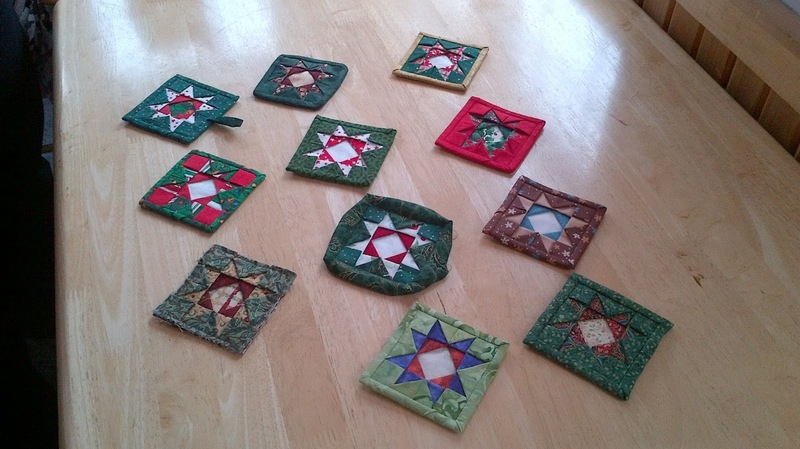 At this retreat I showed how to make a small folded star block that would make a coaster or a Christmas decoration. The picture shows some of the finished or almost finished little stars. I had some tricks for reducing the bulk on the outside edges as this finishes about 4". This was the third annual retreat and I for one hope there will be a fourth annual retreat. It is refreshing to get away and share a laugh or two with so many like minded souls. I also love to see the colours people select for their projects as it always gives me new ideas for things to put together. 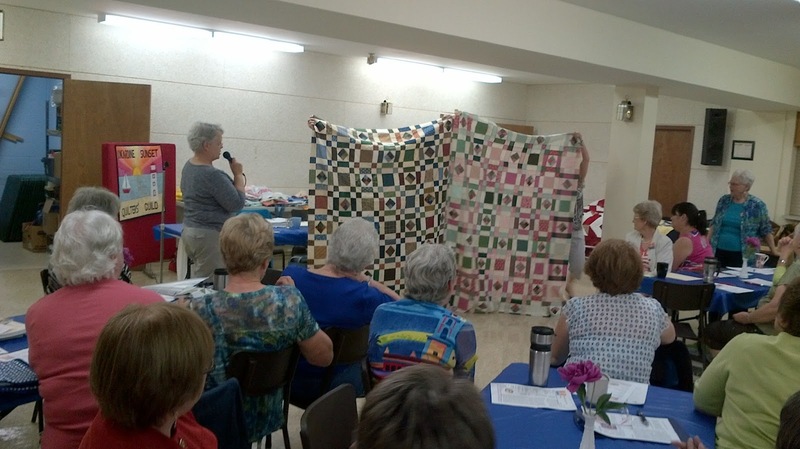 Yesterday was the sunset Quilt Guild in Kincardine. It was the day for the big reveal of our monthly banners. The whole guild was divided into small groups and each group picked a month. Ours was July. The patterns for this project were by Kim Schaeffer and American designer so July was fireworks and the fourth of July. So we had to redesign the project for our Canadian audience. All the hangings are being donated to the new Community Living building next month. I must say we have a talented and creative group. One of the regular features of the guild is "The Survey" held each May. 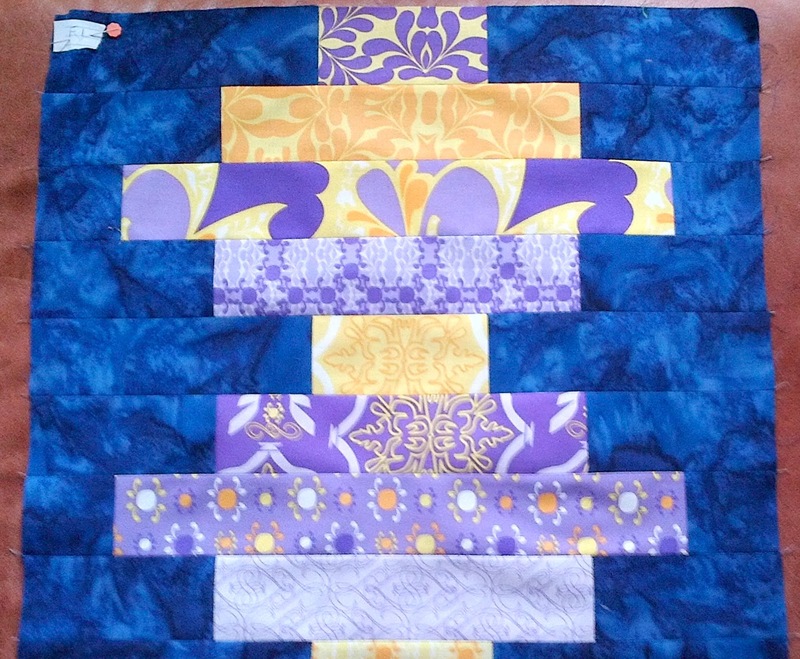 The survey seeks feedback on guild members quilting background and interests as well as what aspects of the guild members participated in. Then asks for ideas for future speakers, programs or workshops. The Survey results are presented in June and my observation is that this is used to influence the program and Guild activities the following year. Our group had too much to say so we didn't finish all the questions. But most groups did finish. Honestly I don't know how they keep up with life and write a blog too.The last three weeks have been a little more stressful than I prefer. 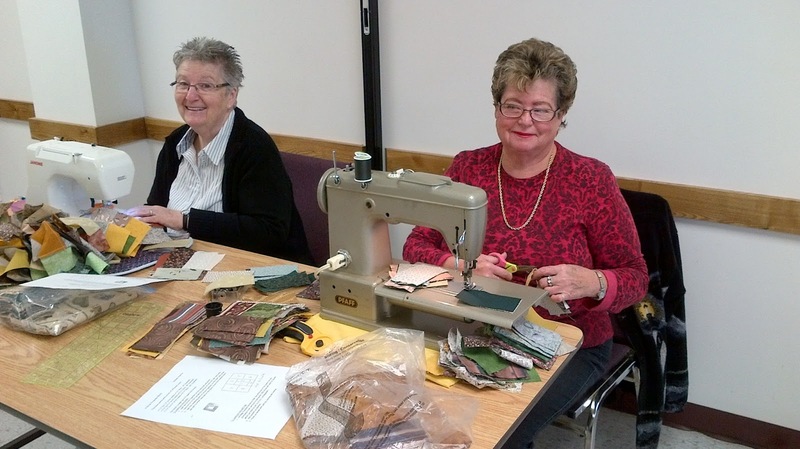 At the left is a picture of Sue and Lorraine diligently working away on the Scrapbag project I organized for March. I will look forward to seeing the assembled tops when we have our April get together. 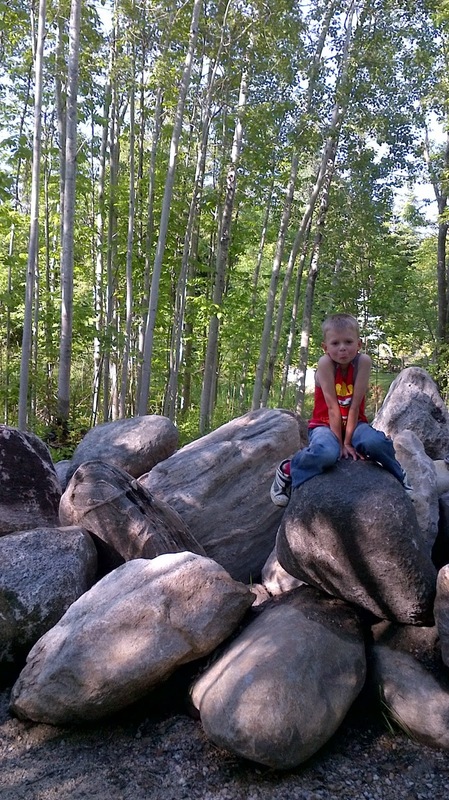 We had much better news on our Grandson's health after his visit to the oncology clinic at McMaster yesterday. Oh my, what a relief. 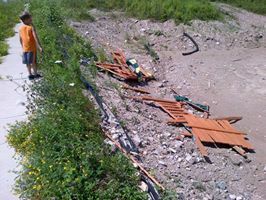 Now all that remains is to get the family relocated by the first of June. I have been doing some sewing but not finishing much in the last little while. So as the saying goes many works in progress. 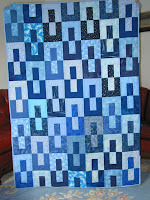 I am thrilled to say I am a Block Tester for Quiltmaker magazine for their 100 Blocks magazine. We are currently testing blocks for the fall issue of the magazine. The retired teachers of Ontario magazine Renaissance came out last week and I am included as one of the members whose hobbies and pastimes are featured. I spent some time at the local hospital too. They care for you well in our small Emergency Department. It's not too bad during the winter months but once the snow birds return and the summer people settle in you can barely find a place to park let alone get a number to be looked after. They are looking at expansion but there is only so much that can be done. At our house we can't say enough positive things about the group that work there. 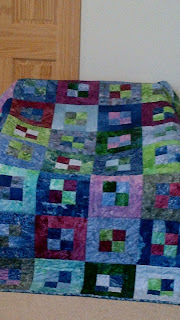 This quilt is ready to go to the Scrapbag group on Wednesday this week. 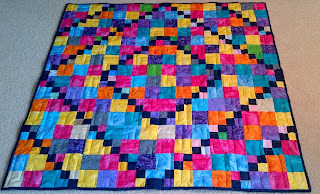 It was a Mystery quilt started on the Mystery for Relay yahoo group. Believe it or not I still have blue scraps after finishing this one. Marge ran this again as a New Year's Mystery so there are likely many of them around. I like the simple clean lines. The Mystery quilt on the right is not quilted but it is assembled. The Kincardine Sunset Quilt guild had a Mystery class for this one. I sewed all day long and did not think I was anywhere near finished. Got everything out the next day and surprised myself with how close I actually was to being finished. Today I sent in my final binding numbers for the cross Canada adventure with the Canadian Quilters Association. This fun activity went on for 6 months and the goal was to see if members and member guilds could sew enough binding to cross Canada. My final total for the 6 month activity was 4602 inches or approximately 128 yards. It has been a busy week in the quilting department. 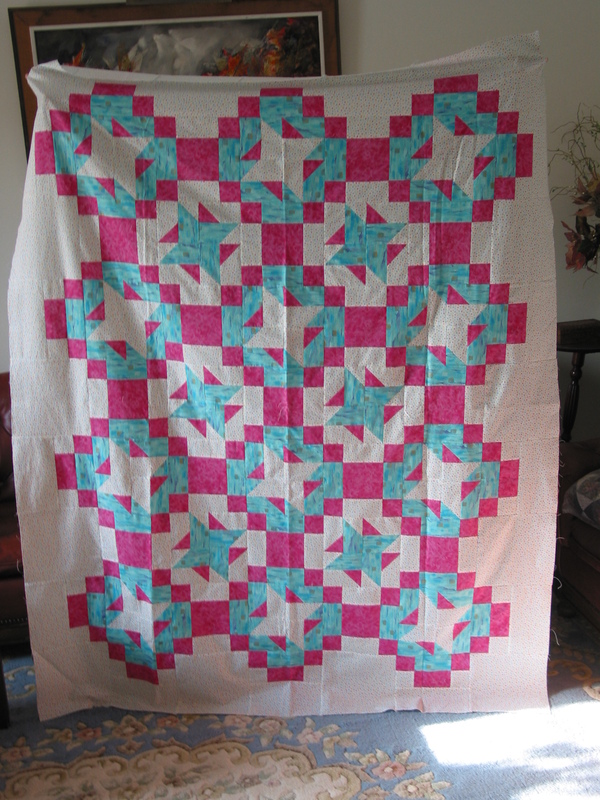 I have finally assembled my top based on The Giving Quilt by Jennifer Chiaverini. 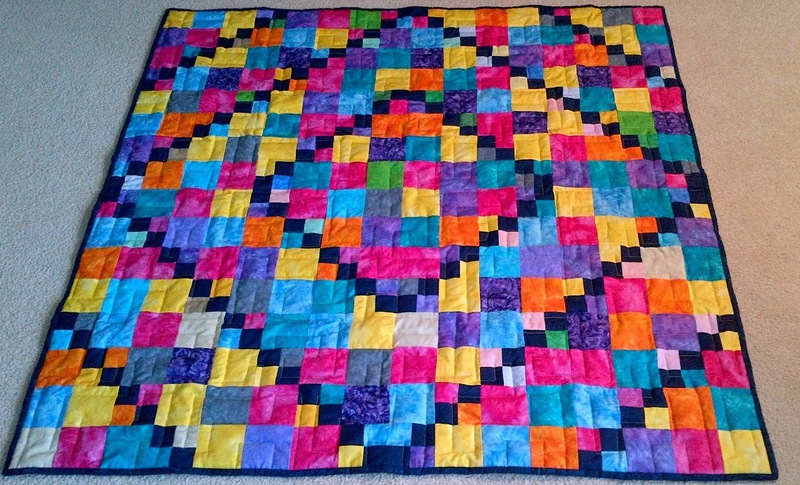 It is bright and cheerful and hopefully will be just the ticket for some child needing a Project Linus quilt later this year. I still have a little time to get it quilted before Cathy returns. The challenge was to make one before she returned from Florida. 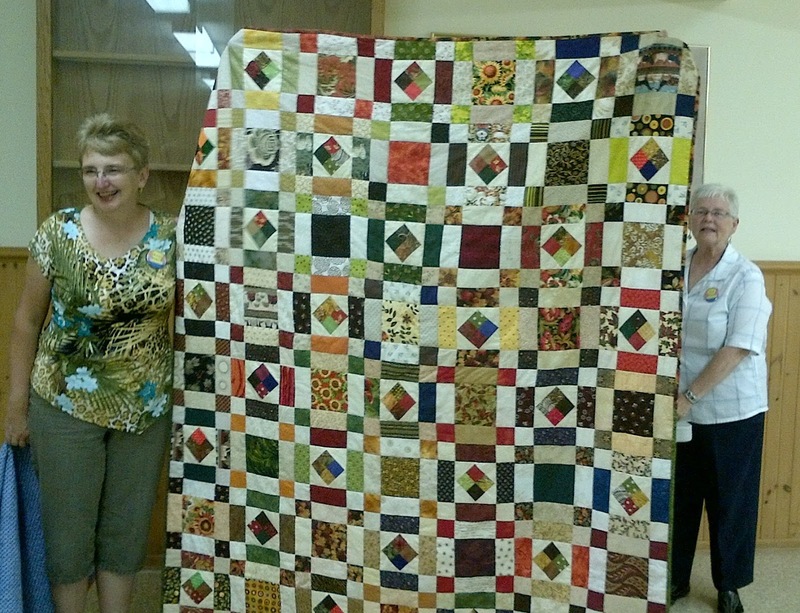 Tuesday the Kincardine Sunset Guild had a Mystery Quilt workshop. Denise taught the class and she was so well organized. I got a large chunk of the work done at the workshop and finished the blocks yesterday. I have the rows to sew together next. 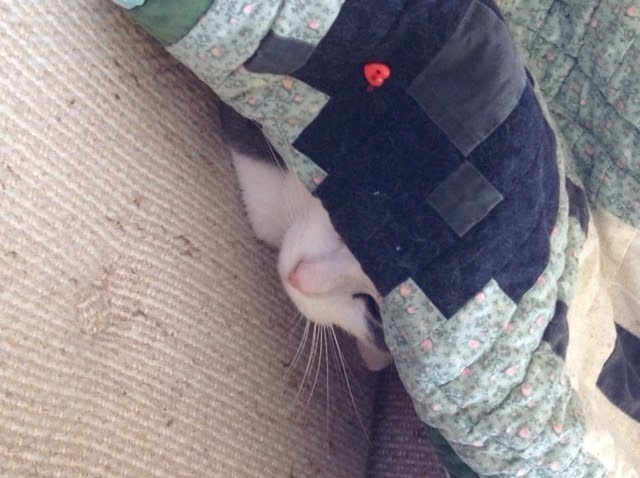 Peeking out from under a quilt I made for my sister is Dewey her cat. It is always nice to know that your handiwork is appreciated. 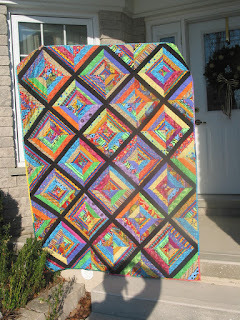 I have been getting my sample ready for the Scrap Quilt Workshop I am doing in May for the Kincardine Sunset Guild. It has lots of little steps but I expect to have the blocks finished before lunch today. I am thinking that if I do not quilt it then people can look at the back for the seam pressing directions. Will have to think about that one a bit. Yesterday was Kincardine Sunset Quilt Guild meeting. The weather was good and we got there and back with no problems. I do so enjoy that group. 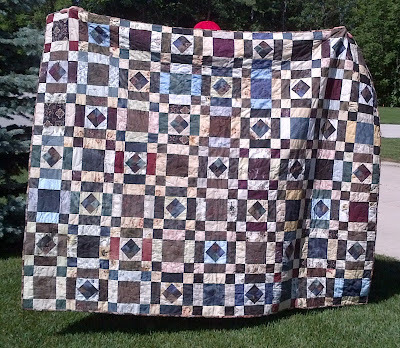 The quilt in today's photo is a recent finish. It is for the Scrapbag group. Cathy made the kits for us and she has a wonderful sense of colour. 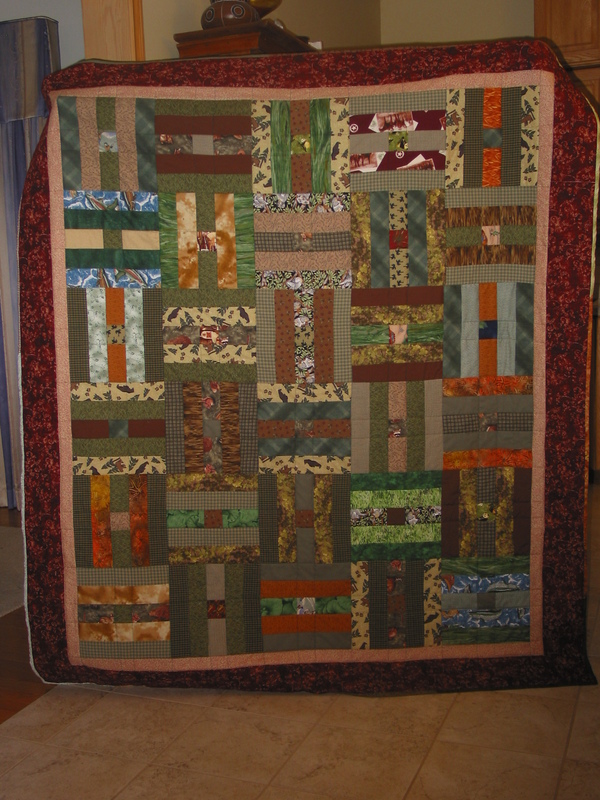 My quilt is very "manly" with fish and deer and forest scenes scattered through the browns and greens. It was made with 2 1/2" strips. Wednesday does seem to be special quilting day with the Scrapbag Quilters meeting on Wednesdays and my Sewcializer group meets Wednesday. Fortunately they share the time so there are no conflicts. I had an interview before Christmas for a magazine article for Renaissance magazine. It is a magazine for retired elementary teachers in Ontario. The theme for the upcoming issue is Popular Pastimes and Hobbies. 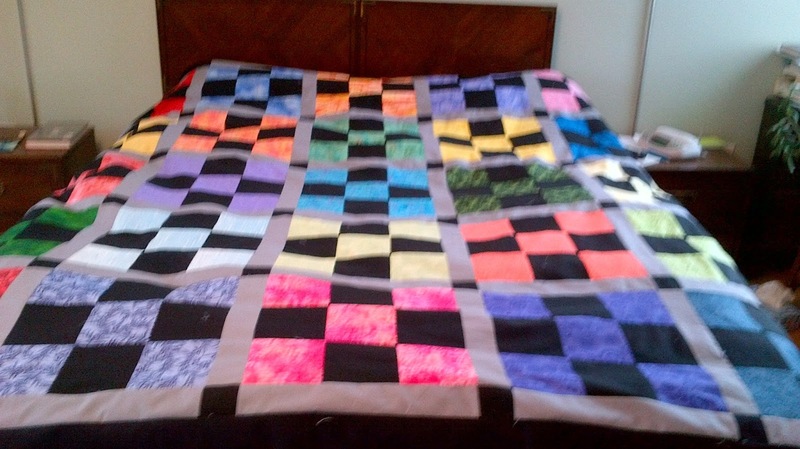 My sister visited her wheelchair bound friend and gave her the little lap quilt I made. Apparently it was a big hit as she loves purple and this one was primarily mauves and soft colours. She is going to let Linda know how it works for her so I can eventually get feed back on the size and the ties I added. The boys are coming up tonight as there are more labour issues in the schools and at this time it looks like a one day strike tomorrow. It is being called a study session or some such thing. 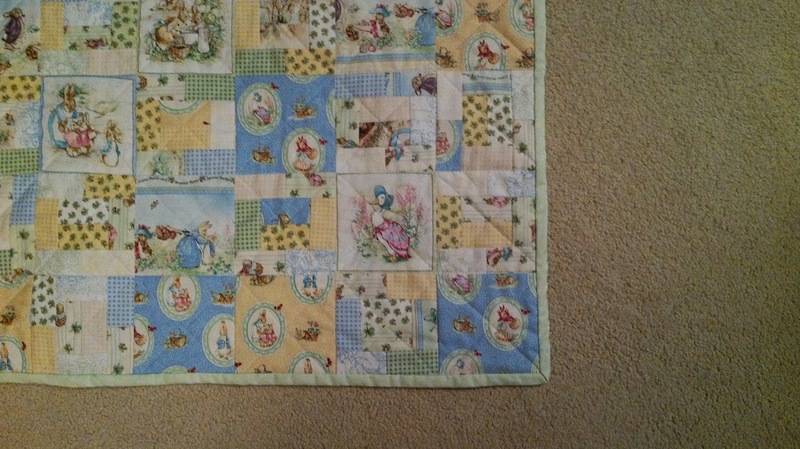 This is a small baby size quilt. 40" by 40". Often what we make is determined by how much we have to work with. 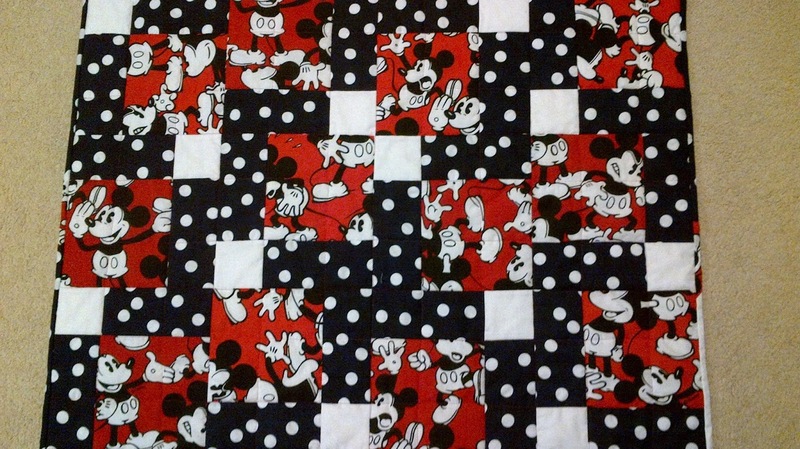 this started out as a very little bit of the Mickey Mouse fabric. 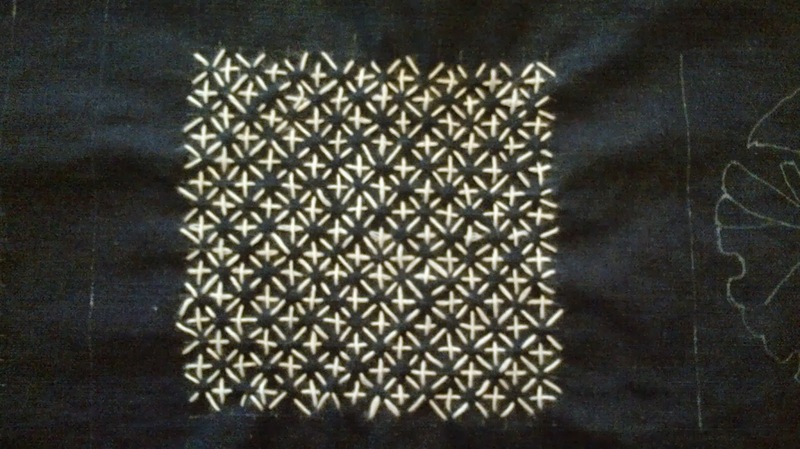 It is the disappearing nine patch pattern. The weather decided on our behalf that we would not go to the quilting bee in Kincardine on Friday. After we decided not to risk it we heard there were many cars in the ditch south of town so decided we had made a good call. I have been working on the hand sewing part of bindings this week while the college football games roll on and on. There have been some close and interesting games. The boys came up for a little overnight trip. We are being threatened by 5-10 cm of snow this afternoon so Grandpa took them home a little early. Xavier, the older one has come to the conclusion that making quilts is my "work".